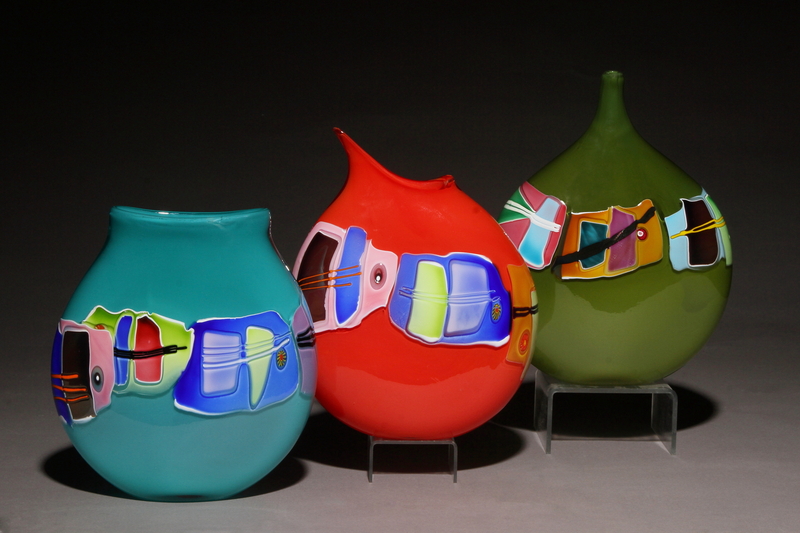 James Wilbat’s glass is distinguished by his fusion of abstract design and playful use of color. By merging ancient glassblowing techniques with his modern eye for design, Wilbat creates glass that unites tradition and innovation. His color and composition are highly influenced by his love for Abstract Expressionist painting. Wilbat’s style has evolved over time, drawing upon his background in ceramics and experience in both drawing and painting. Wilbat had the opportunity to study under talented glassblowers, including Joel Myers, Dan Dailey, William Carlson, and Vernon Brejcha. While all of these masters influenced his development as an artist, Wilbat’s own style can be described as whimsical, yet functional. Wilbat is involved in every process required to create a piece, including sketching, color choice, blowing, assembly, and finishing touches. In order to create his unique pieces, Wilbat utilizes a multitude of tools, such as blowpipes, cherry-wood tools, molds, and a marver table. His studio is equipped with a furnace, reheat chamber, and annealing ovens. 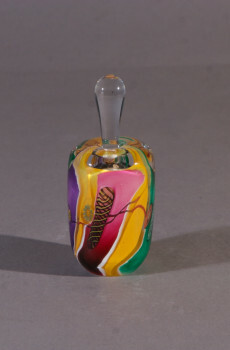 To achieve the bold and vibrant colors that distinguish his pieces, James Wilbat gathers clear class and incorporates colored shards that are blown the day before, rolls the clear glass in colored powder, or picks up larger pieces of colored glass frit from the marver table. 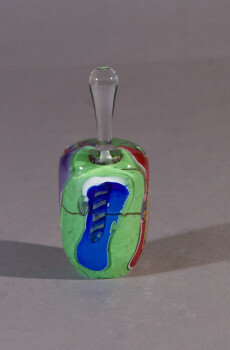 Smaller details are added by using hollow cane, thin lines of colored glass, and his signature coiled shapes, which are formed by twisting two fused strands of glass. Once all of these decorations are prepared, Wilbat begins creating each piece by gathering a mass of hot glass from a 150-pound tank of molten crystal, which is constantly heated at 2200 degrees Fahrenheit. 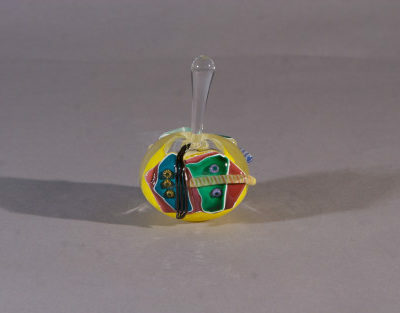 With this gather on the blowpipe, which is a hollow, five-foot long, stainless steel rod, Wilbat constantly rotates the pipe in order to prevent the glass from losing its shape. He gradually builds up the layers of glass and color while shaping the mass with the help of folded wet newspaper, tools, and an assistant for larger pieces. Decorative items are added once the desired shape and size of the piece has been achieved. The glass that is being worked on must be kept at a constant temperature, which is achieved by frequently warming it in a reheat chamber. 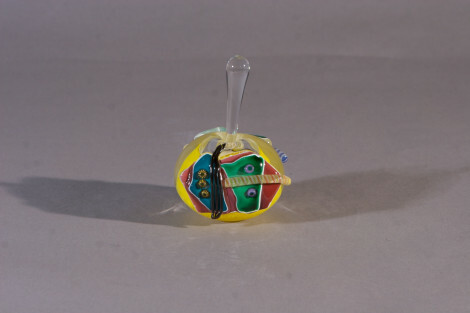 Once the piece has been blown and adorned, it is knocked of the blowpipe and placed in an annealing oven, which slowly cools the piece from 900 degrees to room temperature overnight. The finalizing process includes grinding and polishing, which createst an even and finished bottom. 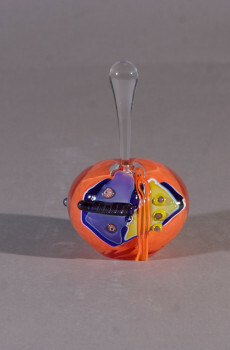 Some pieces are sandblasted, acid-etched, and assembled, before being signed and dated by Wilbat. His work is available across the nation in various art galleries and Wilbat travels year-round in order to sell his work at juried art festivals. In order to reach this point in his career, Wilbat built upon his natural interest in the arts with extensive education and first-hand experience. As early as age ten, James Wilbat’s creativity was sparked when he began studying drawing and watercolor. His passion for art continued at Illinois State University, where he studied ceramics and received a Bachelor of Science in Fine Arts in 1977. While his focus during his undergraduate education was ceramics, he was introduced to glassblowing during his senior year. This discovery was the catalyst for Wilbat’s career; from this point on he was dedicated to learning about this challenging and unusual medium. In order to master this new craft, Wilbat studied at the University of Kansas, earning a Master of Fine Art degree in Design in 1980. Since graduating, Wilbat has continued to develop his personal style and manage his own glass business. Some of the highlights of his career are having his work in the Rockford Art Museum, winning awards at the Coconut Grove Arts Festival, and sitting on the jury of prestigious art shows.